Within my Retirement Investing Strategy I currently hold 3.1% (up from 2.6% at the last gold update due to a buy decision made this month) of my portfolio in gold with a targeted holding of 5%. Gold is the only portion of my portfolio that does not provide a yield (dividends, interest etc). 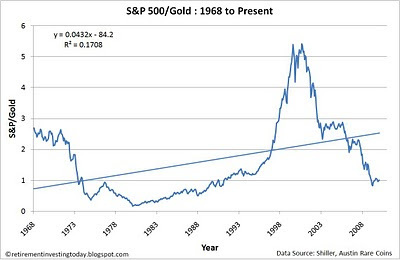 The first chart shows the real price of gold since 1968, with the wild ride that comes with gold obvious. This month the real (after inflation) price of gold has fallen by about 3.2% to $1,096.00 per ounce. The trend line however suggests a price today of $631.00 up from $630.00 at the last update. 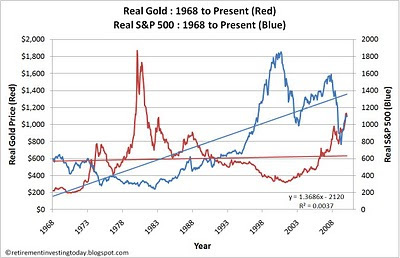 The historical average real gold price from 1968 to today is $600.52. So by both of these measures gold appears overpriced. The correlation between the real S&P 500 (also displayed on the first chart) and real gold lowers slightly from the last update which was -0.34 to -0.33. The second chart provides the ratio of the S&P 500 to gold demonstrating just how far apart the two can vary. Today this ratio is 1.00. The trend line however suggests a ratio today of 2.6 and the historical average ratio from 1968 to today is 1.63. So this measure would suggest that if you were looking to choose to buy the S&P 500 or gold then the S&P 500 might be the better option. I made the decision to buy gold. Largely this is because I have set myself mechanical requirements that bring little to no thought process or emotion into the decision. Only time will tell if the decision was correct. - Gold and S&P 500 January prices are that at time of writing 25 January 2010.